Just a few days after launching their 55" OLED TV in Korea (shipments will begin in February), LG announced that the 55EM9700 is coming to the US, too, with a price tag of $11,999. LG says you can actually place an order now, although we do not know how to do so (LG'g OLED TV page doesn't have a buy-now option yet). LG's 55" 55EM9700 is a Full-HD panel that features 100,000,000:1 contrast ratio and fast response time (1,000 times faster than LCD according to LG). The panel is only 4mm thick and weighs only 3.5Kg. 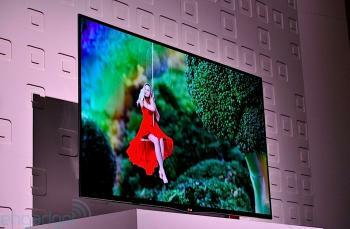 The OLED panel is based on LG Display's Oxide-TFT white-OLED with color filters (WRGB) OLED panel. LG says they are "prepared to ramp up quickly to take the lead in the OLED segment". They see OLED as the "most transformational moment" in the TV industry since the introduction of the color TV 60 years ago.